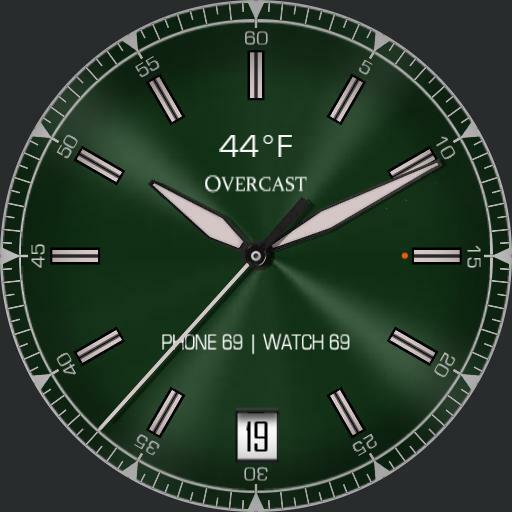 Six-in-one watch face. Classic analog style with smart info integrated into the design. Switch among six jewel tones with a tap - emerald, ruby, sapphire, aquamarine, black pearl and amber. Includes weather, phone/watch battery levels, date, efficient dim mode, tap actions. - Tap orange dot at 3 to cycle through colors. - Tap center to park hands at 9 and 3 so you can read info on the face. Tap again to restore correct time. - Tap temperature to launch stock weather app. Tap above temperature to update weather. - Tap date window to launch stock calendar app.